The Cowens 2” peristaltic pump is ideal for applications where oil water separation is being undertaken. This is because the peristaltic motion of the pump does not agitate the oil water mix and cause it to emulsify. Emulsions are harder to separate. The pump is completely self priming, has a vertical suction head of over 8m, can pump from 5m3/hour to 20m3/hour, and can run dry for short periods so long as liquid has previously been pumped through. We offer diesel engine (hand start or battery start), petrol engine, single or 3 phase electric motor drive and a completely intrinsically safe water turbine drive. The unit comes in a 2 or 4 wheel frame with collapsible handles or on a ground plate with a compact carry frame. The internal hose is interchangeable for compatibility with different pumping fluids, and of course there are no seals or exposed bearings to worry about. It is used exclusively by the UK fire brigade where reliability and guaranteed performance are their primary concern. The Cowens Peristaltic Pump will pull a full vacuum, pump all liquids up to 50,000 c poise & clear up chemical spillages, no matter how aggressive. It will run dry, is portable and easy to move. It can pump solids up to 9.5mm diameter, polythene bags, wet rags and still perform for 2,000 hours between major service. It can pump acids, slurries, air/water, solvents, paints, body lotion, sewage, general effluent, water, oily sea water and more. This pump represents one of the more radical recent advances on the basic peristaltic pumping principle. With a design offering all the well known advantages of the traditional hose pump now allied to improved speed output ratios, enhanced suction performance, low capital cost and lightweight construction. The key to the success of the pump lies in the creation of a permanent vacuum on the suction side of the pump casing. This has the effect of accelerating the speed at which the hose tube regains shape when compression ceases at the end of each squeeze movement. The peristaltic pump’s high suction performance, portable, lightweight construction is designed for a wide variety of emergency pump duties including the recovery of chemical and oil spillages on both land and water. The pumping action is generally similar to that of a conventional peristaltic pump with three rollers mounted on a rotor and a smooth-bored internal hose, but with the unique addition of a flexible, internally toothed, separator element. This is fixed to the inside of the top of the pump casing and is positioned over, and completely encloses, the three rollers. As the rotor moves the separator element conforms to the rotational movement by altering shape in accordance with the changing relative position of the rollers. This completely seals the internal portion of the pump casing and creates the vacuum on the suction side The incorporation of the separator element also has the effect of extending hose tube life by eliminating direct contact between the rollers and the hose tube. The rotor turns inside this separating element which is fastened to the casing and seals the inlet chamber from the interior of the pump. The rotor tip reduces the volume of the inlet chamber and so forces the air it contains, out of the pump casing through a channel fitted with a non-return valve. As the rotor continues turning, the volume of the inlet chamber is enlarged and a partial vacuum is generated into which the peristaltic hose expands. Whilst the volume of chamber remains constant, the volume of chamber is reduced as the rotor turns and so positive displacement continues. A soft elastomeric liner is located where the heaviest squeezing of the hose occurs. The cushioning effect considerably enhances hose durability and enables suspended solids up to 9.5 mm to be transferred without damaging the hose. The liner also protects the pump casing from solids abrasion if the hose breaks. The liner can be changed easily if it becomes worn, so maintaining optimum efficiency. The separating element seals the interior of the pump, protects the hose and also protects the rotor from abrasion if the hose breaks. The element can be easily replaced by removal of only two screws. The liquid-sealed pump housing contains one litre of liquid glycerine or silicone which acts as a lubricant, sealing agent and coolant. The vacuum gauge connected to the inlet chamber indicates suction capability of the pump and serves also to give warning of malfunction. If vacuum is not indicated, servicing is required. The Peristaltic hose can be replaced quickly and easily in situ without the need of special tools. The time taken for the hose to regain its shape is a major factor – arguably the most important single factor – in the performance of any peristaltic pump. It affects to a very large degree the pump’s suction performance and self-priming characteristics. Equally important, considered together with the dimensions of the hose tube, it determines the volume of product displaced by each revolution and, consequently pump output and the degree of volumetric accuracy achievable. The actual speed with which the tube regains its shape is governed by several factors, chiefly the elasticity and thickness of the hose tube material, the degree of occlusion imposed by the rollers and the compressibility and adhesive characteristics of the pumped medium. In the Cowens Master Pump the permanent vacuum created on the suction side produces a continuous expansion effect on the internal volume of the hose tube, overcoming any momentary tendency to ‘stick’ and resulting in positive, virtually instantaneous hose recovery when the pressure imposed by the roller is removed. Vacuum assisted hose recovery has an additional advantage. It facilitates the use of thin walled hose tube with a higher volume of product displaced per revolution when compared with thick walled tube of similar outside diameter. Peristaltic pumps, with their glandless construction and the pumped media retained inside the hose tube, are inherently versatile but in the case of the Master Pump the range of liquids handled is greatly increased by the availability of a choice of five hose tube materials – Butyl, Hypalon, Natural Rubber, Nitrile and Polyurethane. With this range of tube options the pump, which is available with petrol, diesel or electric drive, is widely used for emergency pumping and for dealing with chemical spillages. Other typical duties include tank and container emptying, sump drainage, sewage pumping and for handling industrial chemicals, wastes, effluents, sludges and slurries. Solids, both hard and compressible, can be pumped up to 9.5 mm diameter. The Master Pump design is glandless and valveless with only the hose tube and coupling in contact with the pump liquid throughout the entire pumping cycle and with a choice of five tube materials the pump can be used for dealing with chemical and industrial spillages, waste and effluents as well as high solid content sewage sludge. Capable of dealing with all types of oil – clean or dirty – thin or viscous and of handling solids up to 9.5mm in diameter Cowens Master Pumps are designed for operation with high suction lifts and long suction lines up to 92 metres (300 ft) with full dry running capability and performance totally unaffected by the ingress of air into the suction line. This latter point is an important feature when operating in conjunction with oil skimmers or belt type pick up devices, notably when dealing with thin surface layers. Where oil absorbent fibre or granules have been used to deal with a spillage, the pump’s solids handling ability can also be utilised to collect the oil saturated absorbent – useful in difficult access locations. Oil spilled on land, roadways, in workshops, parking areas or loading bays etc can be quickly pumped away be means of a vacuum cleaner type nozzle on the end of a suction line. The gentle, low shear, minimum agitation, non emulsifying peristaltic pumping action is an important characteristic when the pump is used to feed oil/water separators, emulsification during transfer being a primary cause of sub standard separator performance. For emergency pumping duties in difficult locations, portability is a primary requirement. 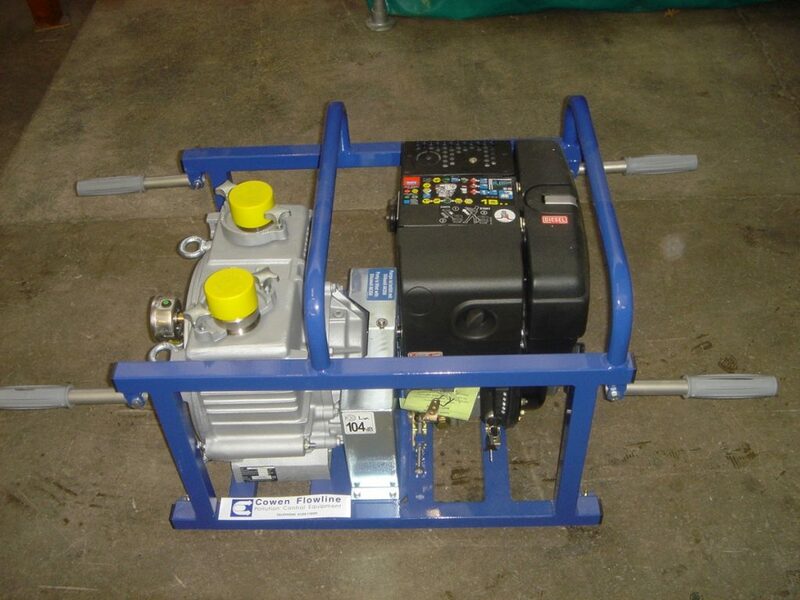 With a 3.5kw petrol engine the Cowens Master Pump weighs 50 kg. With a diesel engine 95 kg and with an electric motor from 55 to 65 kg.